Full disclosure. This is my first Droughtlander experience as a TV writer, When I came to Outlander a year ago, I was able to binge Seasons 1 and 2 right up to the start of Season 3. It was the perfect lead-up, no waiting, anticipation built and immediately fulfilled. Now I understand Outlander fans’ pain. Tomorrow night (and for some STARZ subscribers, tonight), Outlander finally returns with the Season 4 opener. 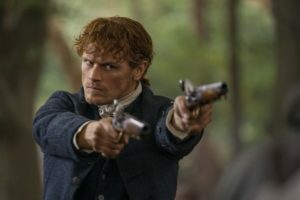 Yesterday and today, STARZ played it smart and offered an Outlander marathon to prepare the faithful for what was to come. Was it worth the nearly 12 month wait? My assessment: Yes. 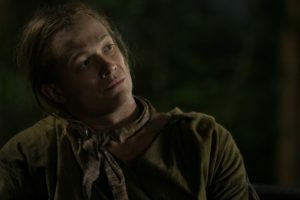 “America the Beautiful,” the first of 13 new Outlander episodes, which will air once a week starting this weekend, is finely crafted, beautifully shot, harrowing and heartbreaking. And one thing is clear: the creative forces behind this much-loved time-traveling drama have gone full throttle, and they’re at the top of their game. 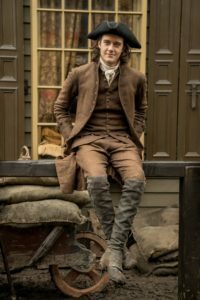 As most everyone knows by now, Outlander’s Season 4 shifts to America, but the the production didn’t shoot there—somewhat inexplicably, Scotland stands in for North Carolina. The oft-repeated joke is that since the characters will spend most of their time in the forested part of North Carolina, a tree is a tree is a tree. 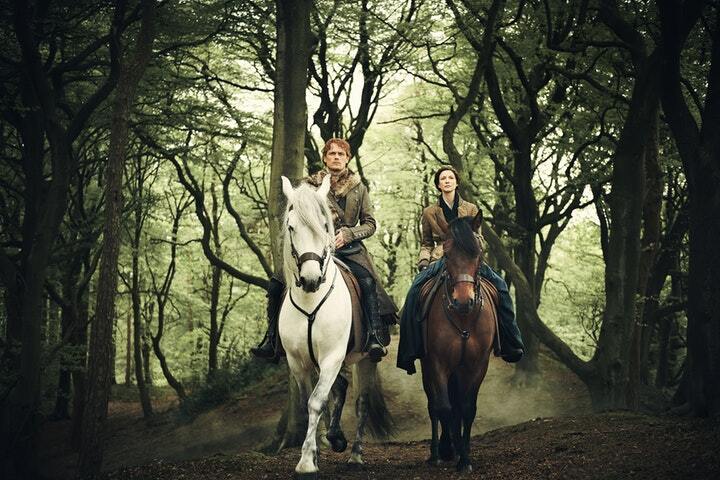 But that gives short shrift to what the Outlander team has accomplished. Jon Gary Steele, the production designer, Stuart Bryce, the set decorator, directors of photography Stijn Van Der Veken and Aladair Walker, Richard Briscoe, visual effects master, and director Julian Holmes have created a set outside the Cumbernauld studios near Glasgow that approximates what North Carolina in a burgeoning America might have looked like. Their fine-tuned attention to detail makes the small screen seem bigger in depth and breadth, and location becomes character. 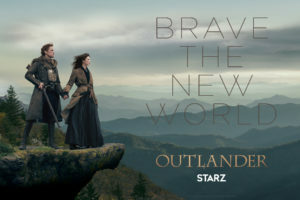 Claire Randall (Caitriona Balfe), the time-traveling World War II nurse and her 18th Century Highlander husband Jamie Fraser (Sam Heughan), have arrived in the New World where they may finally have a chance to live safely and peacefully, with the destruction of the Highlander way of life behind them. Black Jack Randall, their nemesis, is dead. Lord John Grey, Jamie’s capturer-turned-champion, has fixed it so Jamie is no longer a wanted man. Jamie’s Aunt Jocasta, who settled along the Cape Fear River in North Carolina years before, will provide respite while they ponder their future together. Of course, since it’s Outlander, nothing is ever that simple, and this episode begins with a horrifying reminder of how tough it was to live anywhere in the 1700s. In this preview, I have to thread my way around the many spoilers, more so for the TV fans than Diana Gabaldon’s fervent book readers. [Full disclosure: I read the books AFTER each season, so I will write from that perspective]. 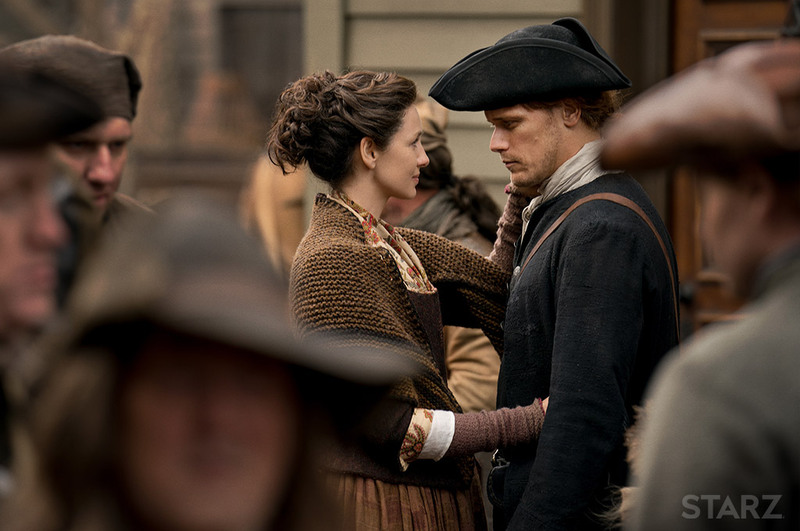 Of course, fans can be both, but since there are many scenes I can’t talk about, what I can talk about are the performances of Sam Heughan and Caitriona Balfe. 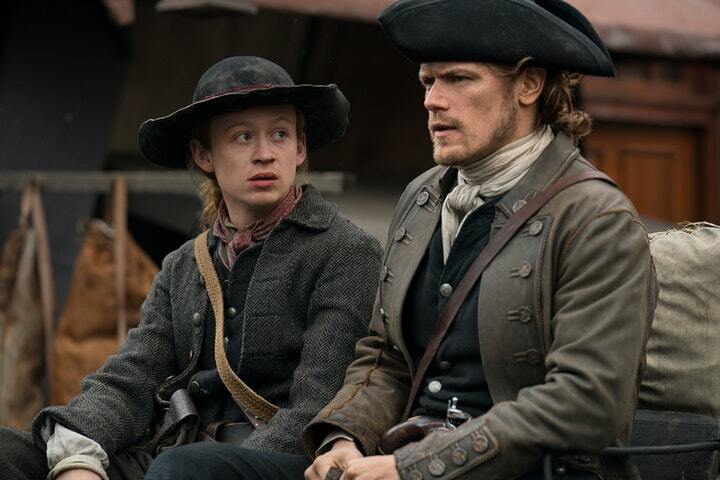 While I can’t tell you anything about how this episode begins, I can draw attention to a carefully crafted performance from Sam Heughan. There is a moment right up front that should convince anyone who is watching critically what a fine actor he is. What Season 1’s “Wentworth Prison,” heralded, Heughan builds upon here. 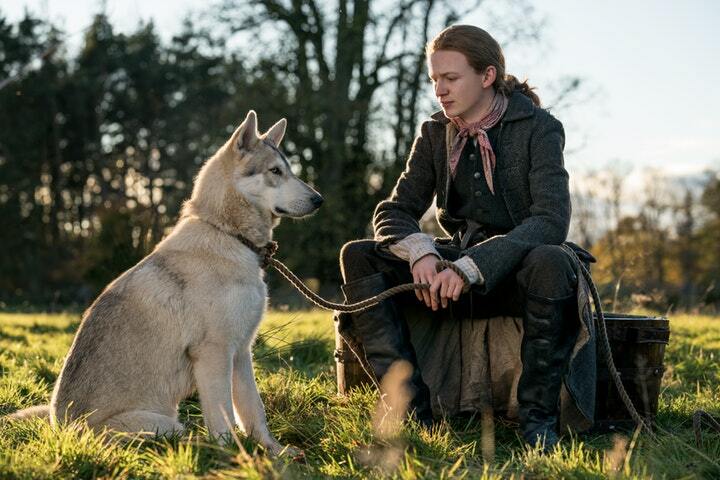 Jamie, it seems, will never escape his past, and in this scene, Heughan relives every moment of it without uttering a word—the losses, the suffering, the sacrifices, the loyalty, the strength, the powerlessness and the pain. He does it with a graceful economy, in the eyes, in the set of his mouth, in his stance. It’s a scene that will be watched tonight and tomorrow, and rewatched, just for what Heughan accomplishes. Both Heughan and Balfe, working from a stellar script from Executive Producers Matthew B. Roberts and Toni Graphia, seem to understand what love is like for a couple who have been through every conceivable challenge and somehow, managed to come out the other side. Their intimate scenes in this episode are centered around what they have learned about each other, 24 years together and apart, yielding a deep tenderness between them, believable and beautiful. The two stars have calibrated their performances to reflect that gravitas, and it’s impressive work. 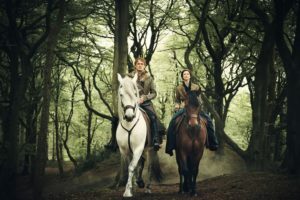 There’s no story without conflict, and it seems that Outlander would be hard-pressed to match the performance of Tobias Menzies as the reprehensible Black Jack Randall, the British captain of the dragoons who haunted and hunted Jamie and Claire over the first two seasons. Enter Ed Speleers (Downton Abbey) as Stephen Bonnet, the opportunistic thief, smuggler and much worse. Speleers has to manage a wide turn in this storyline, and as is the case with playing a bad guy, there’s always the danger of doing too much, but he handles the challenge deftly. As always, there a few things that didn’t work for me, and I’ll talk about them in the full review to follow. 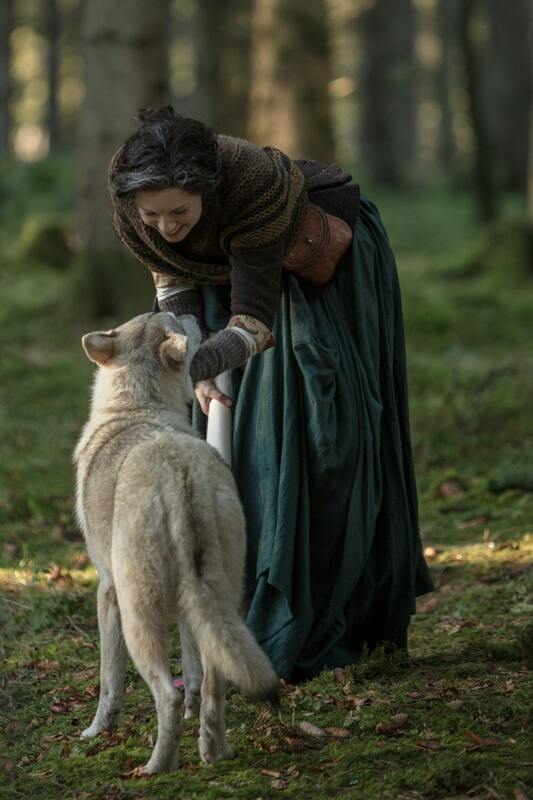 But for now, it would appear that Outlander Season 4 will be most effective at making the pain of Droughtlander a distant memory.